Nearly half a century before Hodgkin and Huxley, in 1907, Louis Édouard Lapicque proposed a mathematical model of nerve cells. Lapicque died in 1952, the year when the famous series of papers by Hodgkin and Huxley appeared in print. 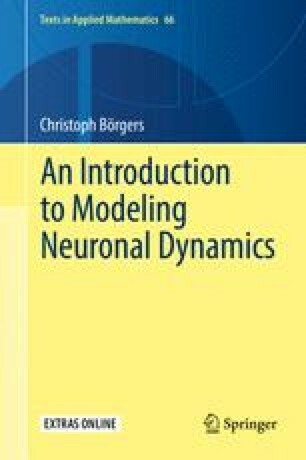 Lapicque’s model is nowadays known as the integrate-and-fire neuron. We will refer to it as the LIF neuron. Most authors take the L in “LIF” to stand for “leaky,” for reasons that will become clear shortly. We take it to stand for “linear,” to distinguish it from the quadratic integrate-and-fire (QIF) neuron discussed in Chapter 8 The LIF neuron is useful because of its utter mathematical simplicity. It can lead to insight, but as we will demonstrate with examples in later chapters, reduced models such as the LIF neuron are also dangerous — they can lead to incorrect conclusions. The online version of this chapter (doi: 10.1007/978-3-319-51171-9_7) contains supplementary material, which is available to authorized users.